Living in NoVA, awnings are a must for the entryways, windows and doors of almost any home, office or condominium – so, for Northern Virginia, PatioShades Retractable Awnings is also a must. Homeowners and businessowners of NoVA: For head-turning awnings that get your business noticed, for reliability and affordability, for protection that’s Hand-Crafted, Above The Rest™, go straight to the place that provides quality, comfort and value. Welcome to Patio Shades Retractable Awnings, a proud NoVA business serving all Virginia, the District of Columbia, Maryland and the entire country. Through our international partnerships with some of the world’s most recognizable names for exquisite awning and window-shading design, fabrication and manufacture (such as K.E. Durasol), PatioShades provides NoVA with the latest innovations and greatest inspirations in both classical and contemporary awning design. We then use American craftsmanship to construct, by hand, your new awning feature. At our production facility in New York, we put your new shading machine together, ensuring proper fit in preparation for shipment to your door. Order before the end of 2016, and your shipping is free and your invoice is reduced by 20 percent – just use the order code “20in2016” when ordering from PatioShadesAwnings.com. Contact us today. Click through our interactive website here at PatioShadesRetractableAwnings.com, page through our on-line photo gallery, peruse the wide variety of options you have for protecting and enhancing your property, and consult with our Patio Designer and Awning Architect for inquiries about style, color, size, materials and motorized automation. Email us at [email protected], call us toll-free at 1-844-NU-PATIO or reach us at our McLean location here in NoVA at 703-520-1983. Learn for yourself, please, why we confidently say that your awning from Patio Shades Retractable Awnings is Hand-Crafted, Above The Rest™. When your awning delivery arrives ready to install, you can perform the installation yourself or with our help: just call us for assistance. Alternatively, we can put you in direct contact with a professional awnings expert here in NoVA for on-site, hands-on help with getting your motorized or mechanical awning up and shading. With the quality and service we are committed to providing here at Patio Shades Retractable Awnings, you are never alone in the process, from your customized choices about color, style and size, to the final rigging of the awning’s electronics. We’re here to help. On our website, make use of our Patio Designer and Awning Architect to decide among a dark modern look, a lighter old-world style or anything in between. 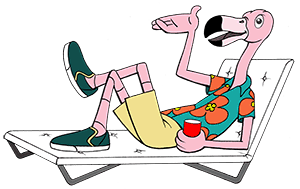 Then, take advantage of our helpful on-line character Frank the Flamingo, who stands (well, sits, really) ready to assist you in taking the measurements that will tell us how big to make your new awning. With an abundance of options at your discretion, the customization is entirely up to you, as the valued homeowner, businessowner, building manager or property investor. In and around NoVA, people have been discovering the affordability, comfort and protection they get from Patio Shades Retractable Awnings – and we’re finding out that they’re glad they did.